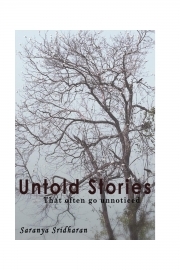 Description of "Untold stories (eBook)"
Everyone has a story. Few, make you jump in joy, Few make you bite your nail, Few let you crouch in a corner, Few make you wince in pain. However it is, all are unique art. Being a vivid reader, I have enjoyed all types of stories. This is a collection of stories with various emotions attached to it to motivate you, make you laugh, to highlight the good things in life and to make you smile. This is a small effort to bring some stories happening around, to your attention. I am sure few stories here, will make you travel with it and find its way to touch your heart. I am Saranya Sridharan, Software Engineer by profession and a passionate author by choice. My hobby was initially just reading and reading alone. Surprisingly, my writing spree ignited at a Haiku competition conducted by my college. This ignited spark then rendered to offer another hobby “Blogging” into my life. I have been blogging since then for the last 6 years. I have published the book ‘Poetic Medley’. I am an author at herspiration magazine. Ashwamegh Literacy Magazine took up a few of my poems for their publications. My stories have been published in drawneartochrist ebook. I like to motivate people, inspire them to be positive in their life. This book is one such little effort taken by me to do it. For more updates on my latest posts check out my blog at http://ani1dotme.wordpress.com. Reviews of "Untold stories (eBook)"